© Jose Luis Magana /AFP/Getty Images Outside the Supreme Court on Oct. 6, 2018. Liberal journalists bending over backwards to defend the violent, left-wing mobs now plaguing this nation fundamentally misunderstand how political protest works in this country. The “angry mobs” that Republicans have been denouncing, they claim, are nothing more than high-minded activists engaging in the “freedom to assemble” because they’re “appalled” by GOP policies. It should come as a relief to The Post, Baldwin and Lemon that Republican lawmakers have never so much as hinted that Congress should pass such a law. Their only demand has been this viewpoint -- neutral enforcement of laws against violence, harassment and destruction of property — none of which even remotely conflicts with the right to assemble. That’s why you need a permit to hold a demonstration in a public space, and why such demonstrations can be restricted to the location specified in the permit. Nor is private property safe from the depredations of the rabble, despite the fact that the First Amendment only applies to the government, and nowhere requires private citizens to open up their homes or businesses to protesters. With active encouragement from Democrats such as Rep. Maxine Waters of California, radical leftists have taken to forming flash mobs when they spot a Republican official dining out. This sort of behavior is inconvenient for the people on the receiving end of such abuse, but the real victims are the restaurant owners whose livelihoods are threatened by it. The incitement shows no signs of abating. Last week, former Attorney General Eric Holder declared that when Republicans “go low,” Democrats should “kick ‘em,” and Hillary Clinton delivered the mafia-esque warning that “civility can start again” only once Democrats regain control of Congress. More fundamentally, the First Amendment guarantees Americans’ right to assemble “peaceably” — a qualifier that increasingly doesn’t apply to the type of behavior exhibited by leftists and Democrat activists. "Antifa" protesters recently shut down public roadways in Portland, Oregon, blocking traffic and intimidating the hapless motorists stranded by their lawless antics. 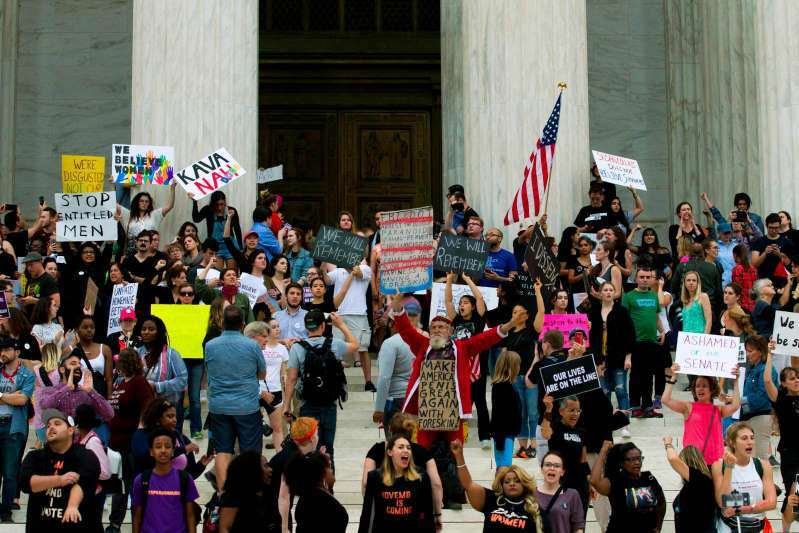 Meanwhile, in Washington, D.C., police made hundreds of arrests as protesters opposed to the confirmation of Brett Kavanaugh to the Supreme Court flagrantly violated rules designed to ensure the orderly functioning of public institutions. At least 300 protesters were arrested for unlawfully demonstrating at a Senate office building, and nearly 200 more were arrested for similar infractions at the Capitol and Supreme Court buildings. The numerous Democratic partisans masquerading as objective journalists seem to think that this is just what “activism” looks like in a constitutional republic. But on those rare occasions when conservatives are “appalled” enough by Democratic policies to actually protest, they show that it is indeed possible to “petition the government for a redress of grievances” without creating new grievances for their fellow citizens in the process. The foremost example of conservative protest in recent memory is the Tea Party movement, which not only secured permits for its events, but also ensured that its supporters fastidiously abided by the terms of those permits. Freedom of assembly is one of the most important rights guaranteed by the U.S. Constitution, which is why the Founders included it in the very first amendment they adopted, alongside the freedoms of religion, speech and the press. The Democrat-Media Complex’s characterization of unruly — and frequently violent — mob action as mere “activism” demonstrates not only a shocking ignorance of basic constitutional principles, but also a callous disregard for the well-being of those individuals who have the misfortune to become collateral damage in the left’s unhinged, self-righteous crusade.